Stamping an Adobe PDF involves inserting an image into certain pages when PDF document is created or to an existing PDF document. This can be done on multiple pages in any document and multiple stamps can be added to any page in the document. Stamping can be performed on multiple documents in a batch and stamps can include multiple images and hyperlinks. 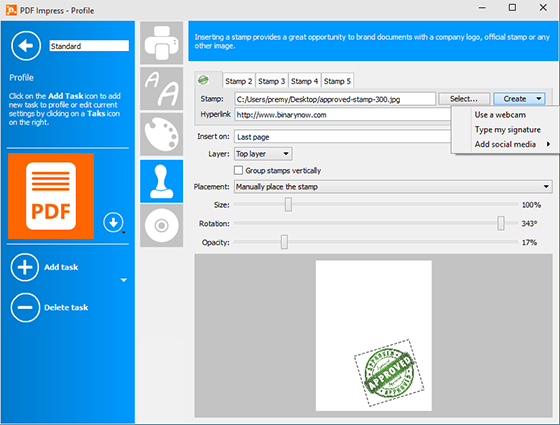 PDF Impress can stamp with an image file ( bmp, gif, jpeg, jpg, tiff, tif, png, mng, pbm, pgm, ppm, xbm, xpm) existing PDF in PDF Impress Tools or Workroom, or it can be done during PDF creation from the print process. Stamp image file can be also created by simply typing in your name or use a webcam by clicking on Create button and by using a social media icons library. Multiple documents can be stamped by dragging and dropping them into Profile shortcut with stamp task(s), right clicking them in File Explorer or Workroom or by using a Watcher with such profile. Launch PDF Impress and click on the Profile on the top. Click on the Profile you want to add stamp to and then on Edit selected profile. Click Add task and pick Stamp. Click browse “Select…” button and select the image you wish to use as a stamp or click Create button to create image file. Choose where you want to Insert on, choose All pages, or you can enter a list of pages separated by a comma (e.g. 1,4,8-16). Manually place the stamp on the page, or use one of the automatic options (e.g. Bottom right). You can change rotation, size and opacity of your stamp. Click BACK button on top left to save your Profile with a Stamp task. Print a document to the PDF Impress printer using the Profile you just edited, or drag and drop multiple files into Convert to PDF using the same profile or right click document(s) and select PDF Impress with profiles and select profiles with Stamp task in it. Note: Step 2-6 can be repeated for adding multiple stamps in the same document. If multiple images are added into a same task, images can grouped horizontally or vertically (e.g. when social media icons are used).